GoodGym helps hundreds of older people have friendly social contact and have basic support over the winter months. Over 2.5 million older people don't have anyone local to ask for help and this can be particularly urgent in the cold weather. As we get older, our bodies respond differently to the cold. Now that winter is here, it's vital that older people can stay healthy, safe and comfortable. This winter we want to provide support to as many older people as possible and to helping out with one-off missions and social visits to help people such as Eve (pictured above on the left) with simple tasks that they cannot complete themselves over the festive period. Can you help GoodGym be there when we’re needed most? 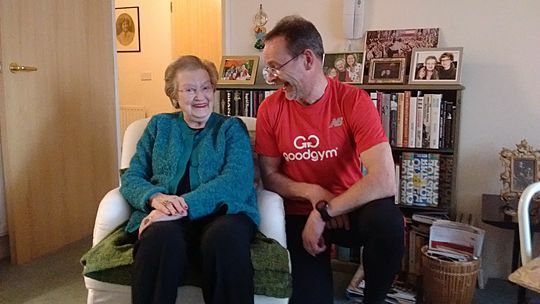 GoodGym helps older people in the UK in two ways; through mission runs and coach runs. We can help older people in winter by running to see them for a chat and to hang out. Social contact helps give people things to look forward to and can help them have a bit more fun at a time when they might be missing friends and family. We call the older people we visit coaches because they help motivate us to run and they share their wisdom. It's amazing what you can learn from your coach. Coach runs can be fit around your schedule and don’t need to take up more than 20 minutes of your time per week. Coach runs are also a great way for you to increase your motivation to exercise and meet your fitness goals when you need that extra push out of the door in the colder season. Every week, we run to help older people in our communities with one-off tasks around the home that they can’t manage themselves. Missions give us a reason to run different routes and make a big impact on someone's life too. Whether your task involves a spot of gardening, moving furniture or simply changing a lightbulb, every little bit of assistance makes the world of a difference during the winter when these small tasks are more important to older people than ever. Wondering what actually happens on a mission? Read more on our blog here. Find out how you can start running to visit an older person each week. Or start running to help an older person with a one-off task in their home or garden that they can't do themselves.